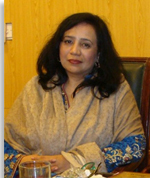 Dr. Humara Bano is working as assistant professor since 2004 & In-charge department since 2008. She joined the university in 1997. She completed her Ph.D in Special Education from University of the Punjab, Lahore with major emphasis on Reading and Writing Skills of Children with Hearing Impairment. She has been serving in the field of Special Education for the last twenty year. She has visited USA, UK, Hong Kong, Bangladesh, Italy, Dubai, Malaysia, Sri Lanka to present research papers in international conferences. She has supervised more than 400 master theses, 04 M. Phil theses, three Ph.D theses. Her main areas of interest are Research and Report Writing, Assessment and Evaluation, Curriculum Adaptation, Inclusive Education, Education of Sensory Impairment, Physical Impairment and Intellectual Delay and Development and Special Education. She is member of many official bodies such as Board of Faculty in Education, Board of Studies in Special Education, Disciplinary Committee, P.U., Un-fair Means Committee, many outside the University. She has also rendered her services as an expert to formulate various policies of special education at national level. She has trained more than 500 Senior Headmistresses/ Principals and DDEOS in Inclusive Education under the umbrella of Directorate of Staff Development, Govt. of Pakistan. Her future plans are to write in national language for the parents and students of special needs for their smooth rehabilitation in the society. As an administrator her dream is establish first Institute of Special Education in Pakistan. Ph.D. with major emphasis on Hearing Impairment, University of the Punjab. Paper published on, “Pure Tone Audiometry in Children”, in Pakistan Pediatric Journal ISSN 0304 4904, Volume 34 (1) 2010. (Pp. 28-32). Paper published on “Inclusion in the Job Market” in Pakistan Journal of Special Education, ISSN 1818-2860, Volume 9, 2008 (Pp 47-56). Department of Special Education, University of Karachi. 1. Delivered a lecture on “Teaching reading and writing skills of hearing impaired children through video simulation” on 5-8-2002 at Dewa Academy for the Deaf, Karachi. 2. Delivered a lecture on “Interpretive science” on 8-2-2002 in six days workshop on “A review of contemporary research paradigms” arranged by International Institute of Islamic Thought from February 14 to 21, 2002 at the Department of Public Administration, Punjab University, Lahore. 3. Delivered a lecture on “Psychological problems of deaf” in April, 2003 in the Govt. In-service Training College for the Teachers of Disabled Children ,Lahore. 4. Delivered a lecture on “Education of the visually impaired” on 20-10-2003 in International workshop arranged by the Sight Savors International at Layton Rehmatullah Benevolent Trust. 5. Delivered six lectures on Mobility and Orientation in a short course organized by Govt. In-service Training College for the Teachers of Disabled Children from June 21 to 29, 2004. 6. Delivered a lecture on Introduction to disabilities , their education and new trends in special education in the six days Teacher Training Course on New Trends in Special Education organized by Higher Education Commission, Islamabad on 13-6-05 at Department of Special Education. 7. Delivered a lecture on Social Compliance and Daily Living Skills for Visually Impaired in Govt. In-service Training College for the Teachers of Disabled Children on June 4, 2005. 9. Delivered a lecture on “Right Based Inclusive Education” in a two days workshop on Inclusive Education organized by School of Professional Advancement UMT held on March 26-27, 2009. 10. Delivered a lecture on “Development of Lesson plan for the Children with Hearing Impairment” at Regional Office of Allama Iqbal Open University, Allama Iqbal Town, Lahore on 5-6-2011. 11. Delivered a lecture on “Mobility training for children with visual impairment” at Regional Office of Allama Iqbal Open University, Allama Iqbal Town, Lahore on 6-6-2011. 12. Delivered two lectures on “Classroom management for children with special needs in inclusive setting” at Regional Office of Allama Iqbal Open University, Allama Iqbal Town, Lahore on June 13 to 14, 2011. 13. Delivered a lecture on “Inclusive Education in Pakistan with major emphasis on Mental Retardation” at Amin Maktab Centre for Special Education and Training on June 16, 2011.